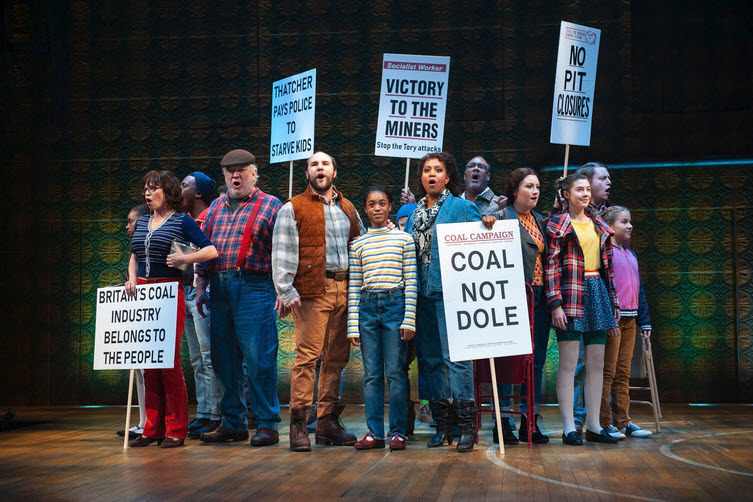 The story of Billy Elliot is a tender tale of a boy who dreams of becoming a dancer while growing up in a working-class mining town in Ireland. But it’s so much more. It’s a universal story of hope, identity and overcoming the odds when everything seems stacked against you. Battling against a macho culture dictated by generations of miners who believe a boy’s education requires boxing lessons (all the better to defend themselves in a drunken pub fight, I suppose), young Billy shows indomitable grit in overcoming the rigidly proscribed barriers to self-fulfillment. Liam Redford (Billy Elliot) and Jacob Thomas Anderson (Michael McCaffrey) in Billy Elliot. Photo by Margot Schulman. Backdropped against a year-long miners’ strike brought on by the repressive politics of Margaret Thatcher and her Conservative Government, the town rallies in a show of solidarity by vowing not to cross the picket lines. Billy’s dad and big brother Tony picket daily, battling a phalanx of police who crack heads and terrorize the protesters. “It’s about our history. It’s about our rights,” Billy’s dad proclaims. Owen Tabaka (Billy Elliot), Chris Genebach (Dad) and the ensemble of Billy Elliot. Photo by Christopher Mueller. Megastar Sir Elton John wrote the music in collaboration with Lee Hall, who wrote the book and lyrics for the film and the musical, as well as the screenplay for Steven Spielberg’s War Horse. Making its Broadway debut in 2008, this electrifying musical won Tony, Grammy and Academy Awards for “Best Musical”. Director/Choreographer Matthew Gardiner gifts us with an astonishing cast led by Liam Redford and Owen Tabaka alternating as Billy; the spectacular Nancy Anderson as Billy’s gutsy dance instructor, Mrs. Wilkinson; Chris Genebach as Billy’s widowed dad, Jackie; Dan Manning as George, the boxing coach; the incomparable Catherine Flye as Billy’s Grandma; and a remarkable young actor/tap dancer/singer, Jacob Thomas Anderson, as Billy’s comic, crossdressing playmate, Michael. 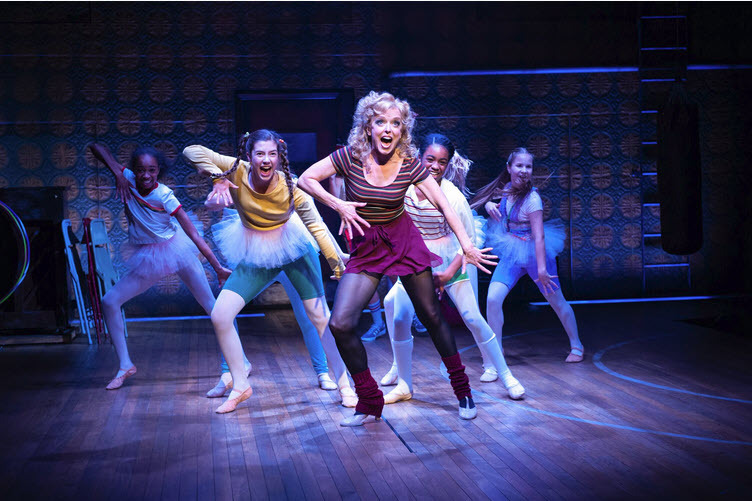 Simone Warren (Keeley Gibson), Sissy Sheridan (Susan Parks), Nancy Anderson (Mrs. Wilkinson), Noelle Robinson (Angela Robinson) and Annie Dodson (Alison Summers) in Billy Elliot. Photo by Margot Schulman. But let’s talk about the dancing. 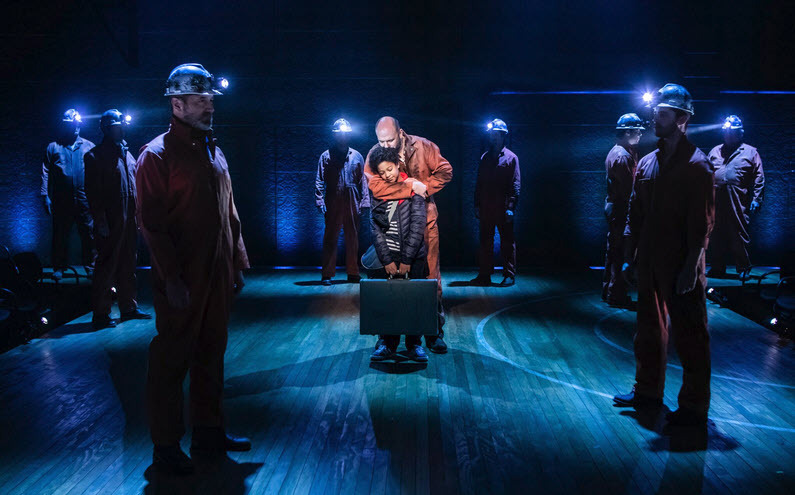 Press night gave us the mind-blowing talents of Liam Redford, a kid you couldn’t take your eyes off of. Highly accomplished in ballet, tap, modern dance, aerial acrobatics (move over Peter Pan wannabes) and singing too, of course, Redford mesmerizes the audience with his elfin charm and precise moves – also notable is his seemingly effortless ease and emotional depth in connecting with the other cast members. More than two dozen kids and adults are also dancers in this production giving us enough hoofing, boogieing and pirouettes for two shows plus – all to the sounds of a nine-piece orchestra led by Tom Vendafreddo. Heartwarming, electrifying and highly recommended. 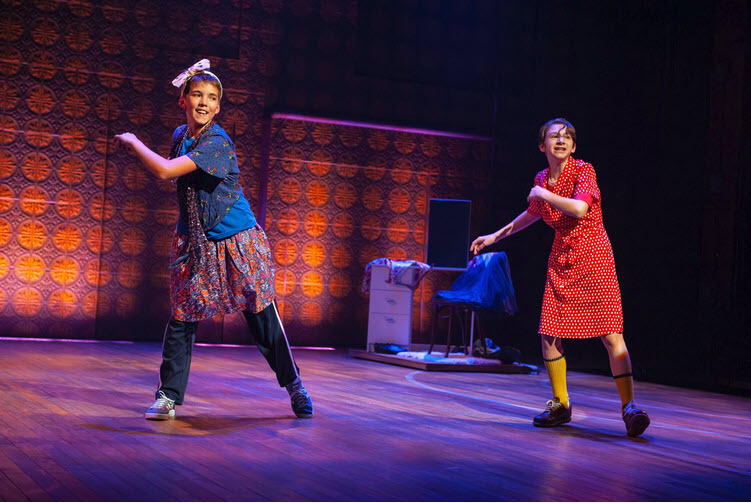 With Sean Watkinson as Tony, Jamie Ecker as Billy’s late mother, Olivia McMahon/Vivian Poe as Debbie, Stephawn P. Stephens as Big Davey, Harrison Smith as Mr. Braithwaite, Grant Richards as Older Billy, and Solomon Parker III as London Dancer. Scenic Design by Jason Sherwood, Costume Design by Kathleen Geldard, Lighting Design by Amanda Zieve, Sound Design by Ryan Hickey with Assistant Director and Dialect Coach Rex Daugherty. Through January 6th at Signature Theatre (Shirlington Village), 4200 Campbell Avenue, Arlington, VA 22206. For tickets and information call 703 820-9771 or visit www.signature-theatre.org.